BROWNING XBOLT ECLP HNT 6.5CR MT GRAY - Corlane Sporting Goods Ltd.
Browning's X-Bolt has a free-floated barrel for stability and maintains barrel to stock spacing, while the recessed muzzle crown helps protect the rifling from damage. It has a bolt unlock button and a top-tang safety. The X-Bolt also features an adjustable three-lever Feather Trigger system which provides a clean, crisp pull with no take-up or creep and minimal overtravel. It includes X-Lock scope mounts. 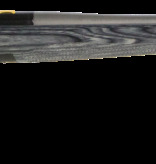 This 6.5 Creedmoor Eclipse Hunter model has a Monte Carlo wood laminate checkered thumbhole stock, matte gray threaded barrel and a blued action, detachable rotary magazine, and a short throw bolt. Included is a thread protector.